These stylish panna cotta take a bit of effort but they’re ideal as a dessert for a special occasion, as they can be made in advance. First make the jelly. Soak the gelatine leaves in a bowl of cold water. Meanwhile, put the apple juice and sugar in a saucepan set over a medium heat and stir until the sugar has dissolved. Reduce to about 400ml of liquid (about a fifth less than when you started), then take off the heat. Squeeze the gelatine leaves to get rid of any excess water, then add to the hot liquid and whisk to dissolve. Pour the jelly mixture into six or eight pretty glasses and refrigerate overnight, until set. to the boil, then reduce the heat and simmer for 4 minutes. Remove from the heat. Squeeze the gelatine leaves to get rid of any excess water, then add to the hot liquid and whisk to dissolve. Set aside to cool, then add the buttermilk and whisk to combine. back in the fridge for 4 to 6 hours, until the panna cotta is also set. medium heat and cook for 30 seconds. Add the Calvados or brandy and cook for 1 minute more. Be careful when you add the alcohol as it may flame up, especially if you’re using a gas hob. Remove from the heat and leave to cool. 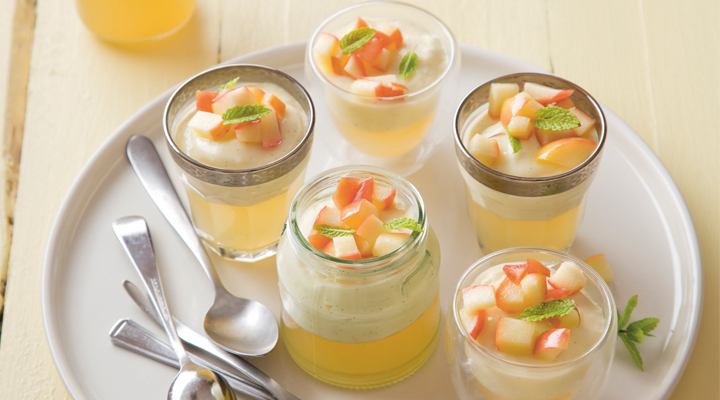 To serve, add a spoonful of the apple compote on top of each panna cotta and decorate with a sprig of fresh mint.